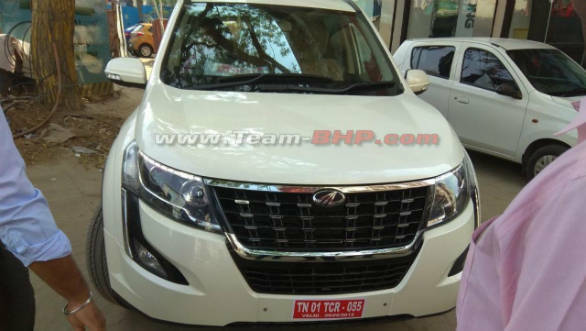 In a development on our Mahindra XUV500 facelift story from a few days ago, the facelifted XUV500 has been spotted completely undisguised before its official launch next month. These images show the front of the car to have a new, subtly chrome-specked grille. This extends into a redesigned smaller central air dam placed below and separated by a chrome accent. Also, the headlights have been reprofiled and now come equipped with LED daytime running lights. 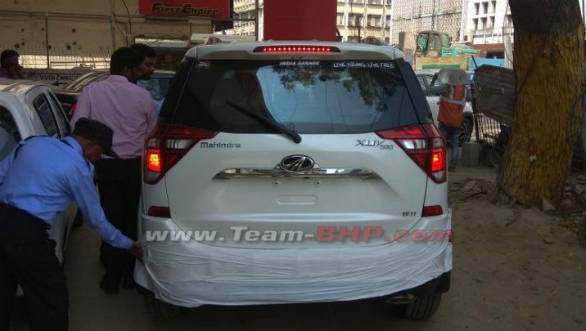 Mahindra has also thoroughly redesigned the rear with new larger horizontal LED taillights split by the bootlid, which now has a new number plate garnish. The new rear bumpers have been beefed up and now have the reflectors placed above it. Further, a new alloy wheel design and body cladding will also be added. While the variant spotted was the top-spec W11 trim, no pictures of the new interior were available. It is expected that it will come with an upgraded infotainment system with Android Auto/Apple CarPlay integration, an 'Ecoscore' calculator, connected apps and an emergency calling function. There will be updated materials in the interior with better dashboard plastics and leather. Another significant change in this facilifted XUV500 will been an updated version of its current AVL-developed 2.2 litre diesel motor. This will produce around 172PS of power, up from the 140PS that the present car produces. These pictures shown this to be the most extensive facelift that the XUv500 has received since its launch in 2011. This will help Mahindra claw back some lost ground in the competitive mid-size SUV segment, which has seen cars like the Tata Hexa, Hyundai Creta and Renault Captur become popular. Customer interest is shifting to this segment from traditional sedans, so Mahindra can expect the facelited XUV500 to be favoured by buyers as it redies the launch of its new facelift - the badge engineered latest-gen Ssangyong Rexton that was shown at the 2018 Auto Expo.